Fleur de Lis Tile Inserts: hand-painted by artist Linda Paul. 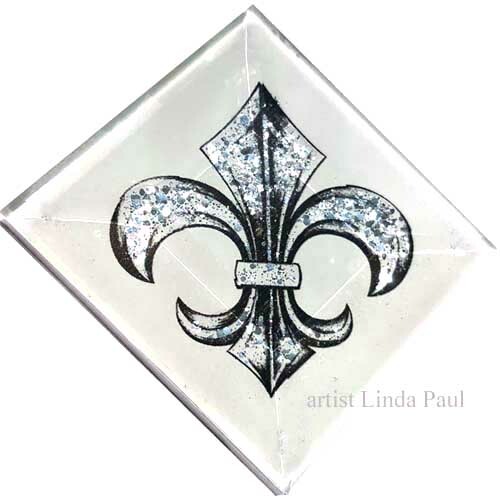 These beautiful fleur de lis accents are hand painted by Linda Paul behind glass. 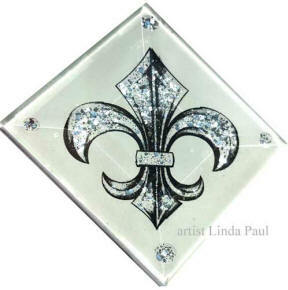 These decorative accent tile capture and reflect the light beautifully. 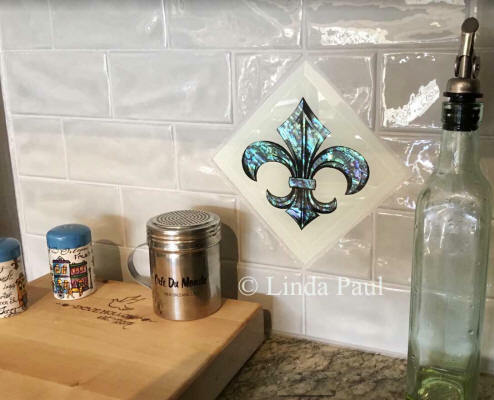 You can insert these glass tiles between other tiles in your backsplash, or glue on top of other tiles or surfaces (onlay style) See below for description and pictures of both styles. 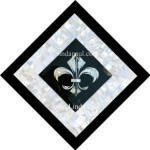 Fleur de Lys tiles are available as diagonal or horizontal tiles. 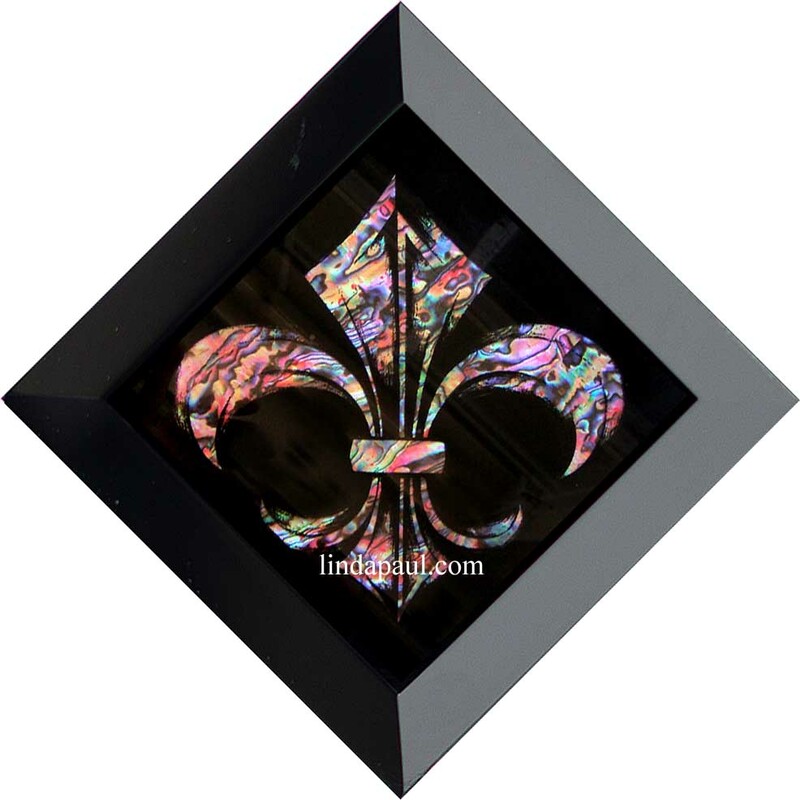 With beveled glass in sizes: 2"x 2" from $29.95 , 3" x 3" & 4"x 4" from $49.95 and 6" x 6" $69.95 to $89.95 each with free shipping. Shop Online for the 2x2 or 4x4" sizes. 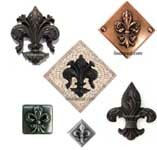 When adding these tiles to your cart, select the style as: 1/4" Thick TILE (with backerboard) or ONLAY (for gluing on top of other tile or surfaces) see picture of these two styles. Also select whether you want the tile horizontal or diagonal orientation. 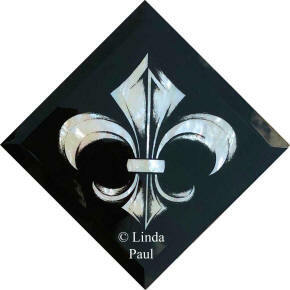 This picture show the two styles of our glass accent tiles from the side and back. 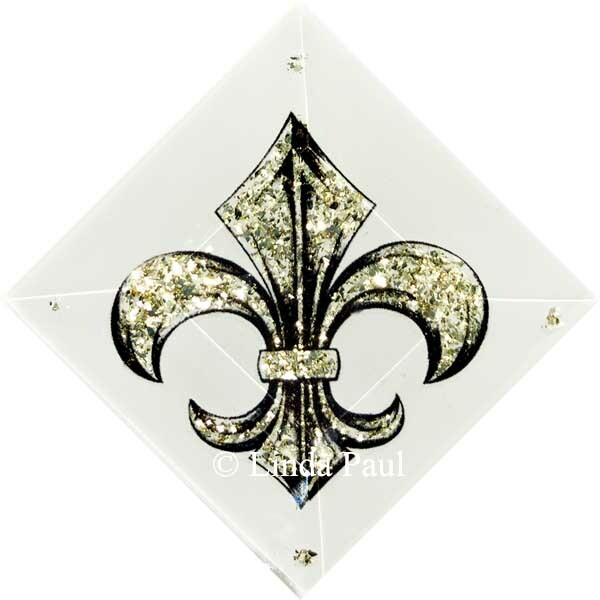 This is for our 2" x 2", 4" x 4" and 6" x 6" styles. 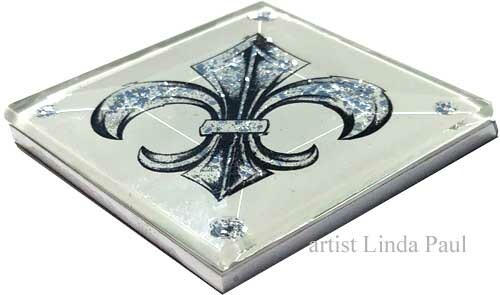 Shows 1/4" thick tile style diamond sparkle and white tile from the side. Glass is mounted on 1/8" board and silicone sealed around the edges. Please let us know if the tiles are going in a shower and we will add extra seal. 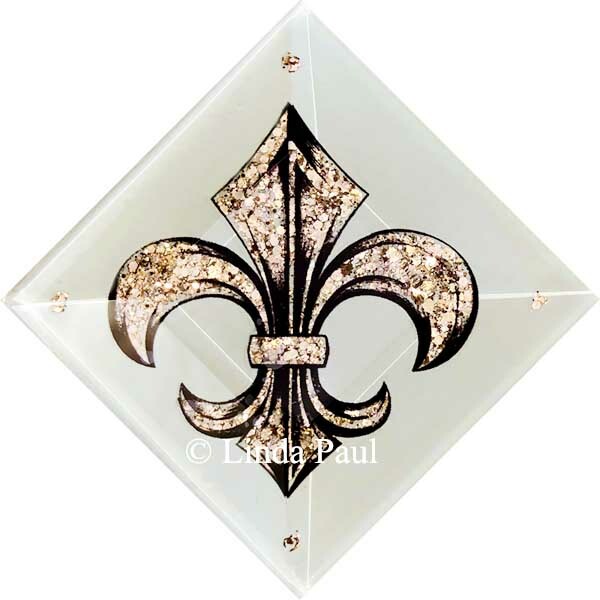 In stock we have ONE diagonal 6" x 6" , TWO diagonal 4x4" and TWO diagonal 2" x 2" . 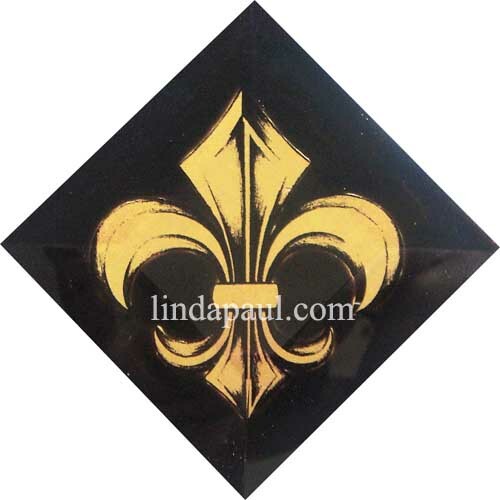 Black and Gold Fleur de Lis Accent tile. 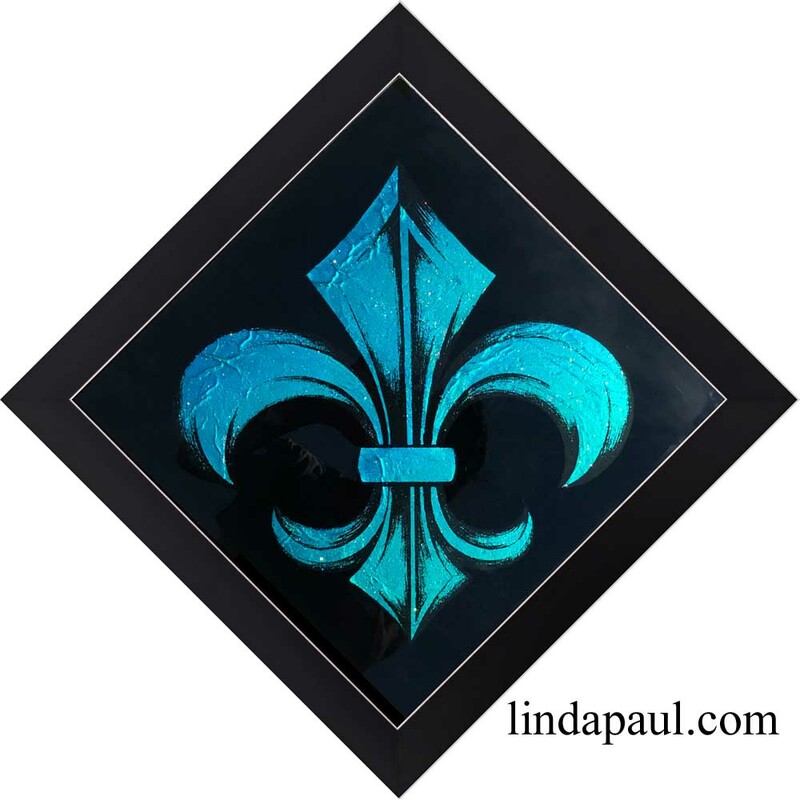 hand-made by artist Linda Paul with 24 karat gold. 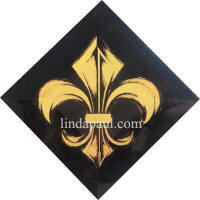 Hand-painted on the back of beveled glass with 24 karat gold and black paint. 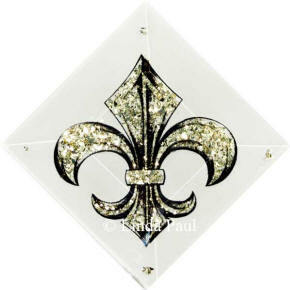 Can be made with diagonal or horizontal orientation. 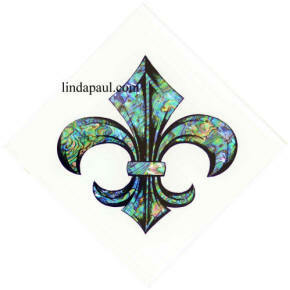 be sure to check out our new paua shell and glass hand made tiles by artist Linda Paul. 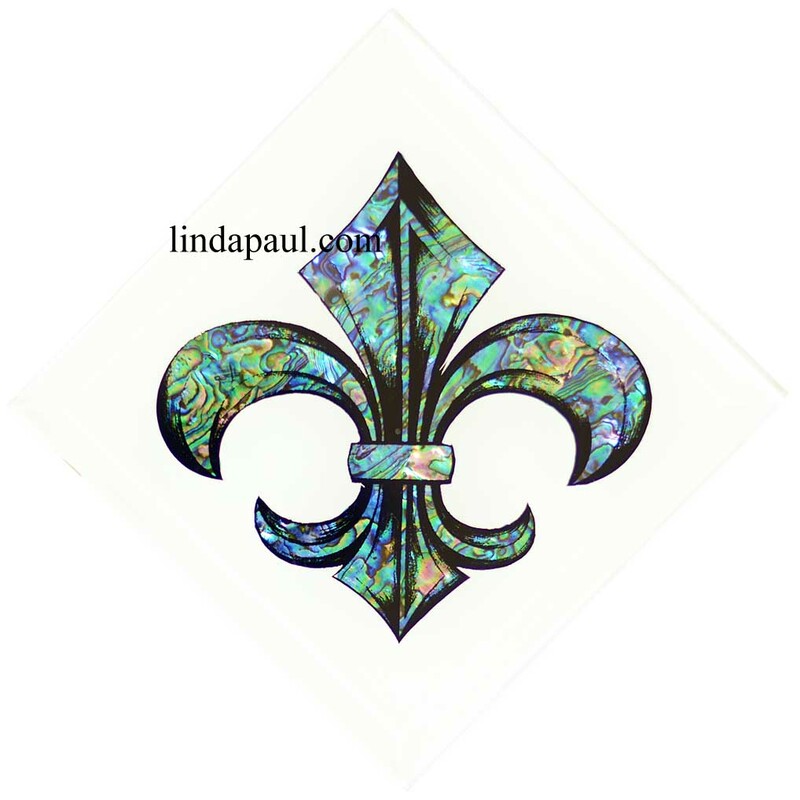 Hand-made glass tiles with iridescent natural paua shell. The painting is behind the glass so super easy to clean with windex. Each side measures 14.25" point to point is 20". frame depth 3/4"
1/4" thick tile - Installs Between Other Tiles: The glass itself is 3/16" thick in the center and 1/8" at the edges (because of the bevel ). We add a 1/8" board to the back so the entire piece is 1/4" thick and can be installed in between your other tiles. 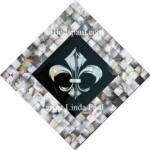 The tiles install just like our regular ceramic or marble tile. 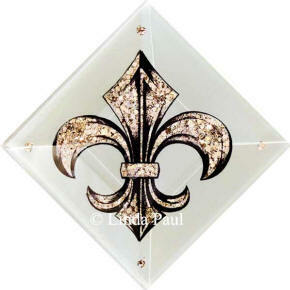 Frame and Hang as wall home decor: The 4x4" glass fleur de lis make great gifts. 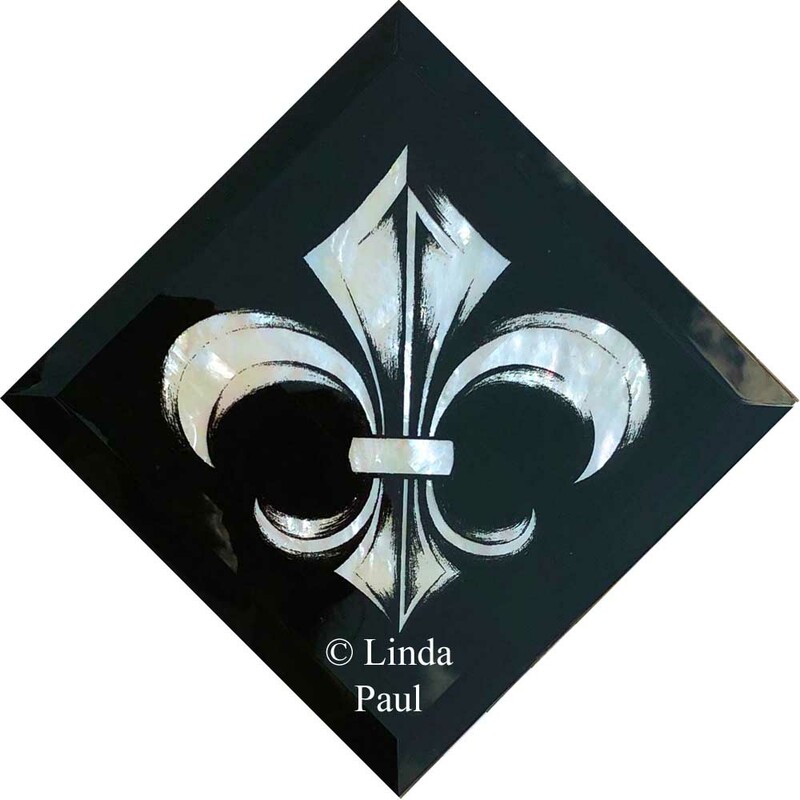 They can be framed and hung in your home as wall decor. Artist owns the copyright of all artworks displayed. Use of artwork is prohibited without written permission from the artist.